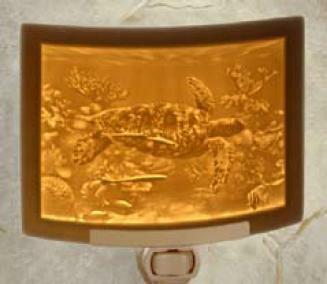 "Lithophane" Translucent Porcelain Sea Turtle Night Light Hand Crafted in the U.S.A.
To create a Lithophane the design is first carved in wax, using a light table as guide to help our artist see the image as he works. 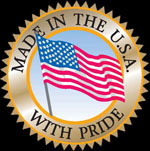 A mold is made from the carving, and then porcelain is pressed into the mold. The dried porcelain is finished by hand and high fired in a kiln to 2300oF, and then each piece is inspected carefully under a light. This high temperature firing makes the porcelain nonporous, durable and beautifully translucent. The gradual transition from thick to thin produces a truly amazing range of delicate shadings. Each Lithophane is a magical work of art, which casts a gentle spell on all those who behold it! These nightlights provide accents perfect for any room in your home or office. Makes a great gift item for your family, friends, loved ones, or even yourself.